Book and pay your Wedding in full by the end of April and receive a free 20 page 15cmx11cm Graphistudio album with our compliments. Your Wedding is the most important day of your life. You invest a lot of time and money into this big day that you have been planning for months or even years. When the flowers have wilted, the champagne bottles are empty and the cake has been devoured, you will only have your Wedding photographs to remind of your special day. Investing in your Wedding memories does not have to cost the earth. Choosing the right Wedding photographer who has the experience and skills to make your day run as smoothly as possible is critical. That means careful research when selecting your photographer including checking their professional skills, artistic style and personal demeanor. Anyone with a camera can take decent photographs on a nice bright day, it's when the weather, location or when things go wrong that the services of a true professional photographer will stand out. I've been in the family photography business since leaving school and offer a personal, reliable and professional service from our initial meeting to delivery of the final edited photographs or album. My Wedding photography contains a mixture of candid, informal and formal photographs taken throughout the day from the bridal preparations through to sitting down for dinner. Every Wedding is different in terms of location, weather conditions, number of guests and your own personal requirements, but working the way I do, I am free to be as creative as possible and supply you with Wedding photographs I know you will love. The photographs stay on my website in a password protected gallery for 3 months so that friends and relatives can view the photographs and order any prints or digital copies. If you wish to have the photographs on the website for longer, this can be extended at £10/month. ♥ Wedding Photography from just £17/month for 12 months! Digital files can be converted to black/white at no extra cost. I supply Italian made Graphistudio Wedding albums that we've found to be the best high quality Wedding albums you can buy. The quality, style and range of album covers is outstanding. They are available in a variety of different sizes and page quantities, and can be ordered at the time of booking or anytime after the Wedding. Larger print sizes and albums available. The latest craze when photographing your evening celebrations! For just £245.00 we'll take polaroid photographs of all your guests and hang them in your Wedding reception. Your guests can then leave a message in the white border below their photographs giving you a very personal, wonderful keepsake of your Wedding. 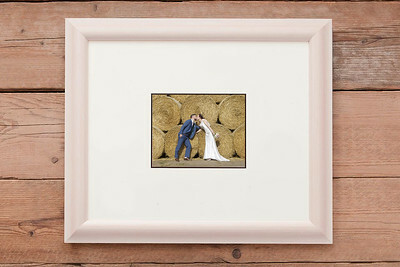 The polaroid photographs are yours to keep and we can mount them into an album or a wall display for you to treasure. Albums and wall displays incur an extra charge. Book your Wedding with us and get a 16"x20" frame including a brilliant white colour mount all ready for your guests to sign at your reception. Usual price is £49.95. Yours for only £25.00 when you book your Wedding. First thing is to check to see if I'm available for your Wedding date. Use the contact page or drop me an email to tippleston@gmail.com or you can call me on 07446 100306. I'm happy to meet up with you and chat face to face over a coffee and see exactly what you'd like from your Wedding photographer. I'm available 7 days a week. You only need to pay a £95.00 booking fee to secure your Wedding day. Although the fee is non refundable, I do accept change of Wedding date, subject to availability, without any charge. The booking fee is deducted off the package chosen. The balance is due 4 weeks prior to your Wedding day, which is when we can meet at the venue and discuss the Wedding photographs in more detail. You may also wish to take advantage of our free Wedding album by paying the full amount in full at the time of booking. Payments can be made by cheque, bank transfer or paypal. I also accept the balance paid over fixed monthly installments. There is no additional charge for this. I undertake a limited amount of Wedding commissions each year. Every Wedding gets 100% of my time and attention. I do not shoot Weddings just to supplement another income – Wedding photography is my profession and as such you are guaranteed professional results. Tippleston Photography,72 Cedar Road, Abington, Northampton, NN1 4RW. I've photographed Weddings all over the UK and abroad but the majority of my Wedding photography is around Northamptonshire, Warwickshire, Bedfordshire, Buckinghamshire, Leicestershire, Oxforshire and Hertfordshire. I've been fortunate to work at some amazing locations including Sedgebrook Hall in Northampton, The Swan at Lamport, Lamport Hall, Northampton Guildhall, The Church Restuarant in Northampton, the Northampton Marriott hotel, Highgate House in Creaton, Northants, Dodmoor House near Weedon in Northamptonshire, Fawsley Hall near Daventry in Northamptonshire, The Stanwick Hotel near Wellingborough, Dodford Manor in Northamptonshire, Whittlebury Park near Silverstone in Northants, The Granary at Fawsley, Collingtree Park in Northampton, Wood Farm at Everdon, Chicheley Hall near Milton Keynes, Brampton Grange in Northampton, Holdenby House in Northampton, Plumb Park near Towcester, Hunsbury Hill Farm in Northampton, Westone Manor Hotel in Northampton, Lamport Hall in Northamptonshire, Brampton Heath golf club in Northampton, The Saracens Head in Towcester, Hellidon Lakes near Daventry, Northants, The Sculpture Gallery at Woburn Abbey near Milton Keynes, Chicheley Hall near Milton Keynes, Eversholt Hall Milton Keynes, The Woburn Hotel Milton Keynes, Safari Lodge ~ Woburn Safari Park near MK, The Barns Hotel, MK, The Great Barn, Oxford, Wrest Park MK, Wyboston Lakes Milton Keynes, Swan Hotel Bedford, Saracens Head, Towcester, Northants, The Saracens Head, Little Brington, Quainton Railway Museum, Horwood House near Milton Keynes, Crockwell Farm near Daventry, and many, many more.